Some housing advocates believe they have come up with an economic solution to America’s housing crisis. Building more, and building more densely, they say, will raise housing supply and bring prices down. In the long run, they might be right. But evidence increasingly shows that people need affordable housing now, and that the long run could be too late. In a study published this March, NYU’s Furman Center for Real Estate and Urban Policy found that the majority of rental units in the eleven largest U.S. metropolitan areas are not affordable to the median renter in that area. Percentage change in renter population and rental housing units, 2006-2014. Source: American Community Survey, NYU Furman Center. 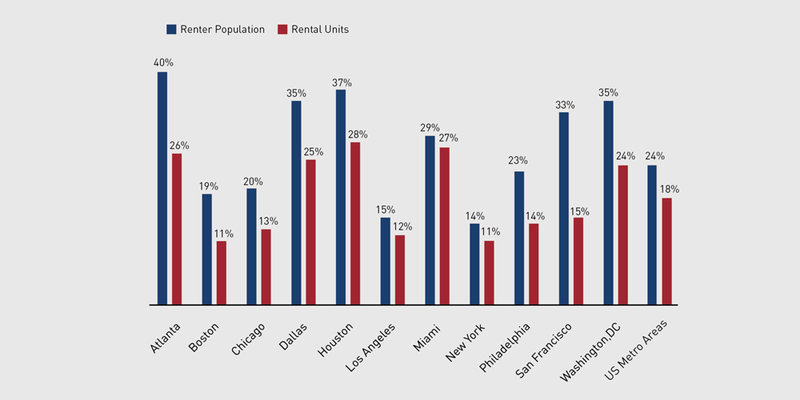 Since 2006, renters have grown in numbers and as a proportion of the populations in all eleven areas—Atlanta, Boston, Chicago, Dallas, Houston, Los Angeles, Miami, New York, Philadelphia, San Francisco, and Washington, D.C. Nationwide, the percent of the population living in a rental unit jumped by about 5 percentage points, from 31 to 36 percent, between 2006 and 2014. Despite growing demand for rental housing, the supply of rental units did not keep up. In each of the areas the Furman Center studied, growth in the renter population outpaced growth in rental units. This supply and demand imbalance has had a number of consequences. Not only have rent prices risen, but more people are crowding into smaller units in an attempt to cut housing costs. These problems aren’t just affecting low-income renters, but middle-income people as well. While city governments have struggled to come up with ways to address the growing crisis, one group thinks that they have found the solution: build, and fast. The YIMBY movement, which stands for “Yes in My Backyard,” believes the nation’s affordable housing crisis is a simple economics problem. Basic economic theory states that price increases when demand goes up relative to supply, so increasing supply—building more housing—will drive prices back down. She has a point. Cities across the country do need to build more housing or, at the very least, consider striking down exclusionary zoning practices that plague communities from California to Virginia. Even if supply increases will drive down housing costs in the long run, in the short run, cries to “Build, baby, build” can be problematic for low income renters. Take San Jose, California, for example. In early July, 670 tenants in a rent-controlled apartment complex found out that they would be evicted and their building demolished to make room for a new development. But Reserve Apartments residents aren’t thinking about the long term; they are too busy worrying about where they will live when they are evicted next Spring. Current tenants won’t be able to afford to live in the new development, which is located in the heart of Silicon Valley just five miles from Apple’s headquarters, fourteen miles from Google, and twenty miles from Facebook. Some have considered moving as far 120 miles away from their current homes, jobs, and schools to Sacramento—the closest place they can afford the same level of housing. Source: Urban Displacement, University of California, Berkeley. Caption added by author. The Reserve Apartments eviction is not an isolated incident. A map of urban displacement generated by the University of California-Berkeley shows that Reserve Apartments are one of many communities facing displacement and exclusion. What’s more, many other communities in San Jose, and across the country are at risk.